Hello Yukiko! The 12 ½ year old red panda lives behind the scenes in Woodland Park Zoo’s red panda yard where he and Hazel take part in the Red Panda Species Survival Plan. While standing on his green balance bone, Yukiko the red panda moves his head from side to side, then up and down. The movements work his abdominal and back muscles as well as spine flexibility. 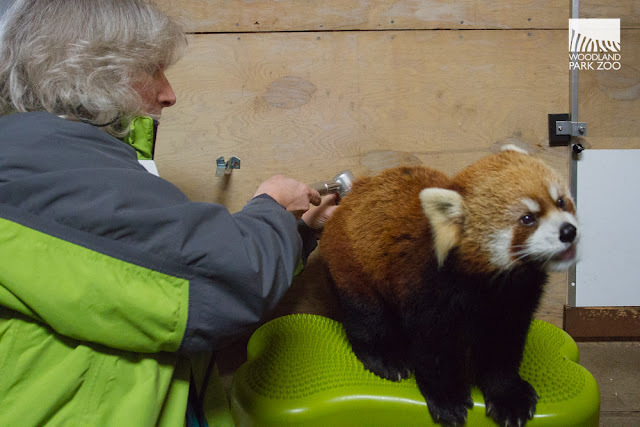 The red panda is undergoing therapy which includes massage, laser therapy and exercises which work his muscles and strengthen his core. Yukiko is 12 ½ years old, so he is showing the normal signs of aging which include minor spondylosis, aging in the spine. Yukiko’s keepers noticed a slight decline in mobility as he moved around his enclosure and especially going up and down the ramps. After deciding on a therapy program with our veterinary team, keepers introduced Yukiko to the therapy equipment, such as his green balance bone and the laser therapy equipment. Barb applies laser therapy to Yukiko’s spine while keeper Jamie asks him to target train. Because Yukiko was already very comfortable around his keepers, his therapy was a breeze. The positive relationship he shared with keepers combined with simple behaviors he already knew, such as targeting, following and allowing keepers to touch different parts of his body made his introduction to laser and physical therapy that much easier. 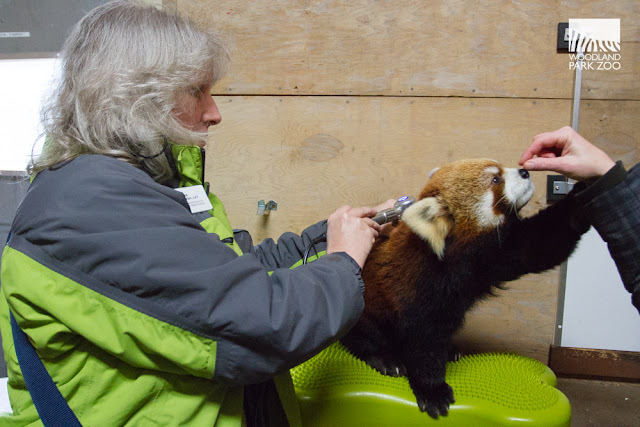 Jamie Delk, one of the red panda keepers, and Barbara Brush, a veterinary technician, worked together to introduce the new moves to Yukiko and make sure he was comfortable during the procedure. Since Jamie had previously worked with Yukiko on target training and following, it wasn’t too difficult to have him do the same moves, except this time while standing steady on his balance bone. They soon added massages and laser therapy to the routine. Yukiko now allows Barb to use the laser equipment and to physically massage him. Standing on the training bone mimics an uneven surface which allows Yukiko to work his core, much like a balance ball at the gym. After just a few sessions, his spine flexibility and back muscles have improved. “Yukiko was a great patient to work with from the beginning. He just needed some familiarity with the laser therapy equipment. His quality of life is improved thanks to proactive laser therapy that capitalized on a strong foundation in training.” says Barb. Yukio had a noticeable gait change when we started his therapy, but now he moves about normally and with confidence. Training with touch and targeting is just one way our caregivers are able to work closely with our animals to provide the best welfare at all times throughout an animal’s life. 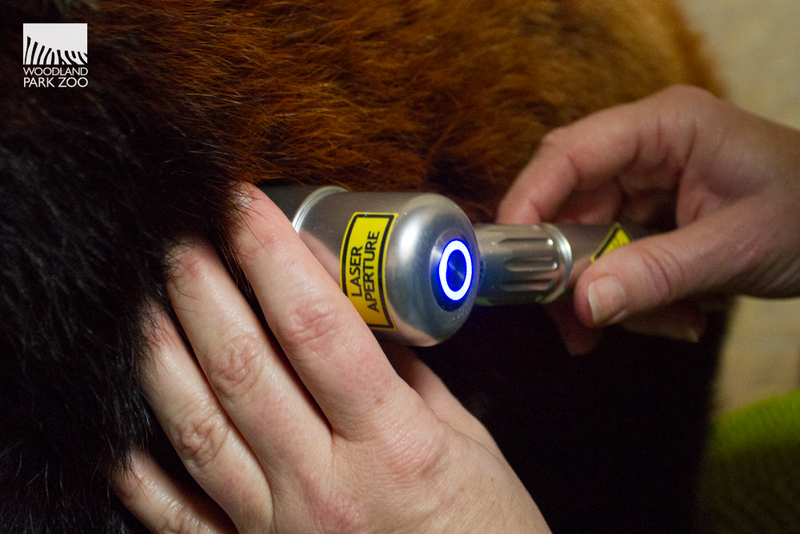 Laser therapy works to loosen tight or atrophied muscles. 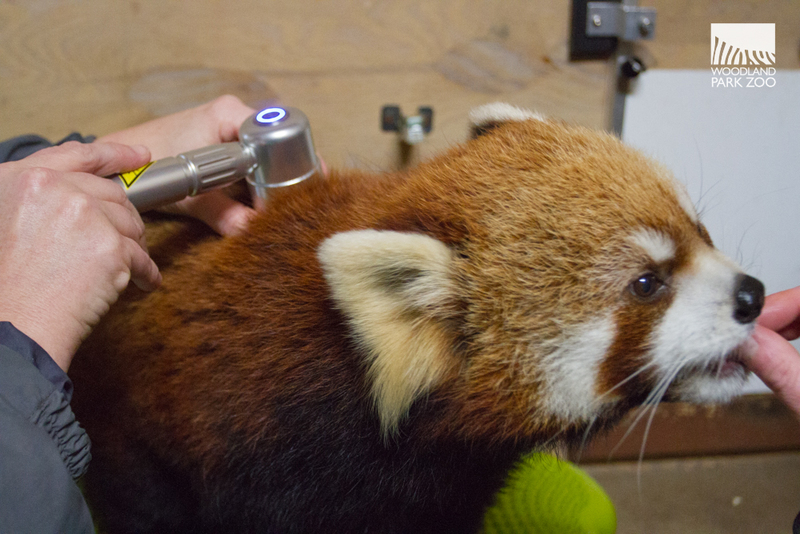 The only difference between people and red panda laser therapy is all that red fur! While Yukiko and Hazel remain off-exhibit where the two can spend time together through the breeding season and beyond, you can visit our other male red panda, Carson, anytime in the Wildlife Survival Zone. The plight of this vulnerable species is an issue that needs your support. In the wild, fewer than 10,000 red pandas remain in their native habitat of bamboo forests in China, the Himalayas and Myanmar. Their numbers are declining due to deforestation, increased agriculture and cattle grazing, as well as urban sprawl. 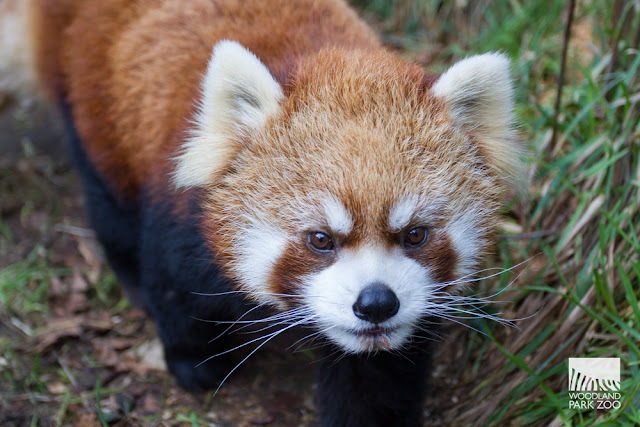 Woodland Park Zoo supports the Red Panda Network working to conserve this flagship species in Nepal. 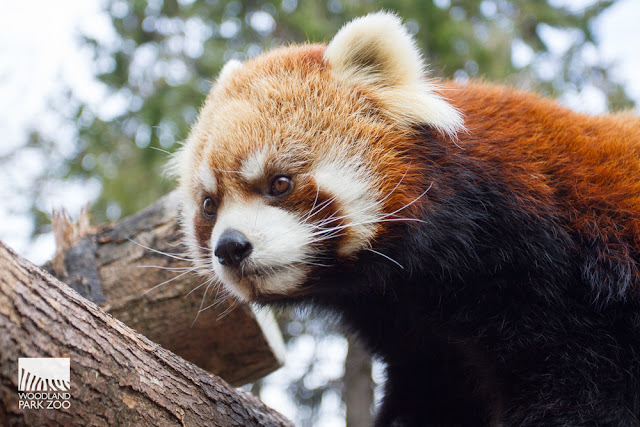 To help support the project and celebrate Yukiko's health, you can adopt a red panda by becoming a ZooParent. THANK YOU! Thank you to Dr. Peter Jenkins, SpectraVET owner, for donating the therapeutic Laser system to our Rehabilitation Therapy Program. New Year welcomes sloth bear twins!